Mar 26: And then there were two! mortonjr77 vs. tous14 for the t-shirt! tous14 sort of backed into it with a default pick Villanova for Elite Eight, and now is limited to picking the winner of the Loyola-Michigan game... not as easy a decision as expected a couple weeks ago! mortonjr77 picked Loyola last round, already used Villanova earlier, so can pick Michigan or Kansas to win and hope the other advances to the Championship game. Good luck to both of you! Pick due Saturday, 6:09pm Eastern. Who is up for a new mini-March Madness Survivor pool? Mar 19: More upsets! I thought I was playing it very safe taking #1 Xavier against Florida State and... nope! I'm out, right along with the North Carolina backers and ShaneD22 with Cincinnati on Sunday. We are down to 10 and get to take a breath. Sweet 16 starts Thursday. Mar 18: We almost made it through yesterday without a loss but the darn Loyola team has back-to-back upsets and some of us couldn't resist picking Tennessee to advance. A bunch of you did not pick and used your default, Villanova, but that won't work twice. It will go as a no pick if you already used a default and don't get your pick in today. Lets see if we can get at least a dozen alive to the Sweet 16. 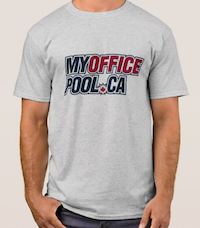 Mar 16: Nice to see 48 vying for a limited edition MyOfficePool.ca t-shirt. No really, there are less than 5 in existence at this time. Don't worry, I won't send you the one I've been wearing. Next pick due today by 12:15pm Eastern or you will get a default which I believe is Purdue. You only get one default pick per entry for the length of the pool. Thanks for playing and good luck! If you haven't tried this before, this is a great format pool, whether you are a big time college basketball fan or not at all. March Madness Survivor! Get caught up in the hype and excitement without filling in an entire bracket of picks. This is our free entry public pool. Single strike and you are out, but I will allow 2 entries per member. We start Thursday March 15th and remember you need to submit a pick before the deadline every day for the first four days of the tournament starting Thursday. Bragging rights are on the line plus an official MOP t-shirt to the last member standing. Join any time, even after the deadline, but new entries after round two (Mar 16) are ineligible to win. Play along for fun. Good luck! If you are looking for a pay-to-play pool then you are welcome to join Mike's $22 entry or $42 entry private pools. No comments found for this pool.